Firefighter Prep: Were You Meant To Be A Firefighter? Should You Consider Becoming A Firefighter? Being a hero is something everyone would like to be considered at least once in their lifetime. For others, the desire to help those in need is something that resides deep within them, something they want to do as often as possible. This may seem odd to others. After all, when danger arrives, a good majority of people would follow their gut instinct to flee and abandon the situation all together. But these people who are willing to put their lives on the line in order to protect others, they are a valuable asset to our society and they very often find themselves in careers that require this special skill, such as a police officer, or in the case of this blog post, a firefighter. If you are someone who has always been enamored with the courage that firefighters have, and you would like to emulate it, it might be time to begin working towards achieving your dream. If you are not exactly sure to start, there is no need to worry. There are plenty of test prep materials available to you online, with the very best ones being housed at Test Ready Pro online. 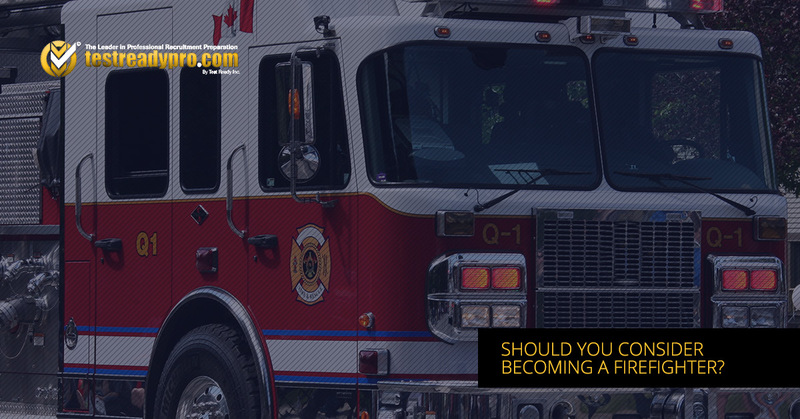 When it comes to the specific requirements that exist for becoming a firefighter in Canada, they will vary from province and by individual fire departments. On the other hand, there are certain requirements that exist across the board, making it easier for you to know if you are even qualified to begin the process of trying to become a firefighter. Let’s discuss this criteria. If you are not considered a legal adult by the date you are applying on, chances are you won’t be able to become a firefighter just yet. While this stipulation may vary by province, for the most part, being 18 or older is a non-negotiable. If you were not born in Canada or you are not a legal landed immigrant, it will be impossible for you to become a firefighter in this country. This is not to say that you cannot become a firefighter in your native country or become a legal landed immigrant so that you can become a firefighter in Canada. It is simply only impossible for the time being. If you have a criminal record that is a mile long, you are not going to have much of a shot at becoming a firefighter in Canada, and perhaps anywhere else. Firefighters are meant to be trustworthy and those who have even the smallest of infractions on their criminal records are not viewed as the most honest people. If you can somehow get charges removed from your criminal record, you may be able to move forward with the process. Knowing standard first aid and CPR is imperative if you are going to be a firefighter. These are the basics of your training and they will be used time and time again if you are to gain a position in your dream field, With that said, it is imperative that you know first aid and CPR like the back of your hand. This will allow for you to save lives time and time again. When it comes to nearly any career field, it’s not uncommon that you have to complete a certain number of classes or a certain amount of training before you can be qualified enough to actually work professionally alongside others. Firefighting careers are no different. In order to know enough to do the job of a firefighter day in and day out, you will have to pass a firefighter test program or equivalent. Otherwise, you will not be able to move forward. Ready to Start Working Towards Your Dream of Becoming a Firefighter? If you want to begin the process of becoming a firefighter, we are the perfect entity to assist you. Test Ready Pro has been helping people in Canada obtain the training they need to enter their dream career for a long time, and you could be the next person we help. Check out our firefighter prep resources online today and find out how we can help you to get everything you want out of your career and more. Learn More About Our Test Prep Today!